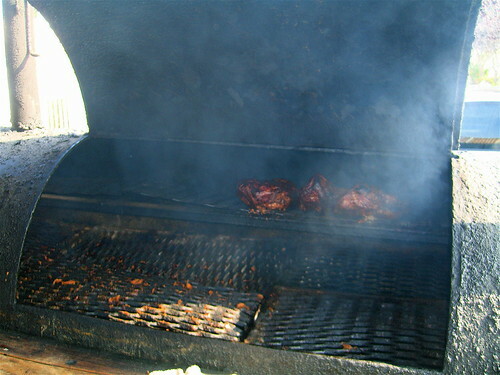 The window to BBQ heaven. Divine visions, however uncommon, come in many forms. Some may look like the Sistine Chapel in the Apostolic Palace at Vatican City. While others may be of angels and saints whispering in your ear, encouraging you to liberate France from your English oppressor à la Joan of Arc. And then there's my personal divine vision which has me judging world renown chefs on a crazy popular cooking competition show on national t.v. (I know, I know, dream on). 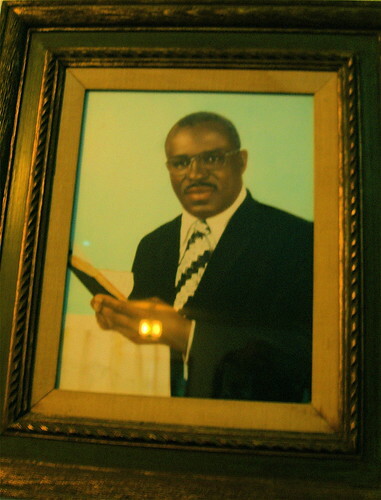 But no matter how unlikely many of these divine visions or inspirations appear, there are probably very few that can match the oddball vision from God that was received by Pastor Corverster Williams Sr. of the Prayer Assembly Church of God in Christ based in Compton, California. His vision: the neck of a turkey smoked long and good and then served up with a hefty slathering of a secret barbecue sauce and to sell it out of a catering truck. Who says God doesn't have a sense of humor? Pastor Williams' ultimate goal was to sell enough of these extremely uncommon barbecued bits of turkey neck to build a new church for his rapidly growing congregation. Pastor Williams' closest advisers, including the Associate Pastor Virgil Wilson, and almost his entire congregation thought the senior pastor might be experiencing a vision but what kind of vision exactly? Did he really see something nobody else did? Or was he simply losing it? 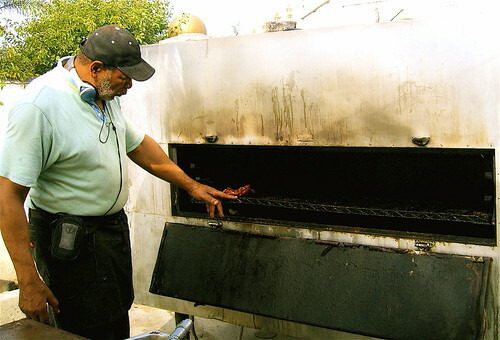 Implementing the skills from running his own barbecue restaurant, Pastor Williams set out to convert the unconverted and started to slowly convince his entire congregation that his vision would soon raise enough funds to build the church of their dreams. However, that would be the easy part. Pastor Williams, the man with the BBQ plan. Now he had to convince the masses outside the church into believing that barbecued turkey necks can be delicious and worth paying for. There was another selling point too. 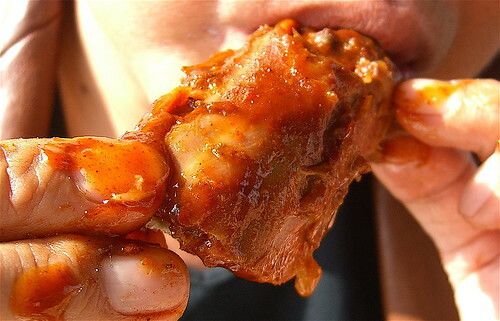 The Pastor believed turkey necks was a healthful alternative to standard barbecue fare such as pork ribs. And since the necks are skinless, they are arguably better for you than barbecued chicken. Pastor Williams truly believed this choice would be beneficial to the community. Still, barbecued turkey necks were a tough sell. It's not a common cut of meat. 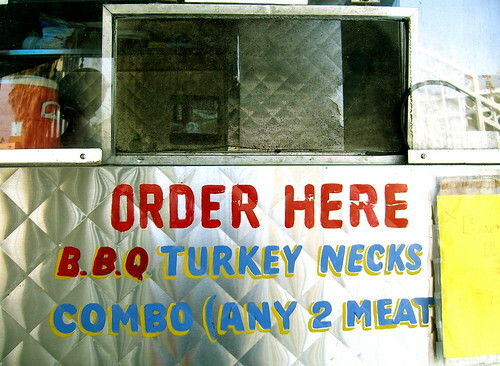 Generally, there's not much flesh on poultry necks. I grew up in a Chinese household where we fought over the neck of a chicken or duck more than we did the drumstick. Although the protein was scant, the act of eating it was pure pleasure. I am from a tribe of bone gnashers, marrow suckers and joint chewers, so the poultry neck is a joy. Unfortunately, there's not much of an Asian community where the Pastor's church is, and, poultry neck is almost never seen on a typical American dining table, so the only thing Pastor Williams could do was what he was already good at — spreading the gospel. He would preach the goodness of the barbecued turkey necks and eventually people began to try them. And, unlike chicken necks, the neck of a turkey is fleshy and can satiate most carnivores. The food spoke for itself soon enough. Then, miracle of miracles, the BBQ fundraiser ultimately sold enough pork, beef, chicken, sausage, sides, and, yes, turkey necks, to build a new house of worship for the Prayer Assembly Church of God in Christ. 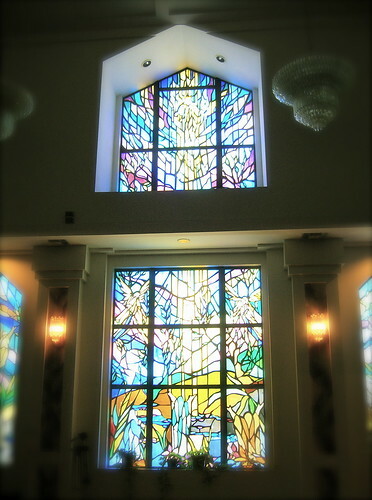 The spacious 3 story building cost $2.3 million back in 1992 when it was completed and took merely two years worth of fundraising to achieve. That is a whole lot of turkey necks, for sure. Can I get an "amen"? The church that BBQ built. Believe it. You don't sell that many turkey necks or any necks for that matter if the stuff ain't good. This stuff is very good. Smoked till every fiber of the meat is tender to the teeth, each bite discharging the flavorful red oak and deep mesquite which fuel the smoker, this turkey neck is the best experience I've had with a neck (outside of certain ex-girlfriends and my wife, of course). 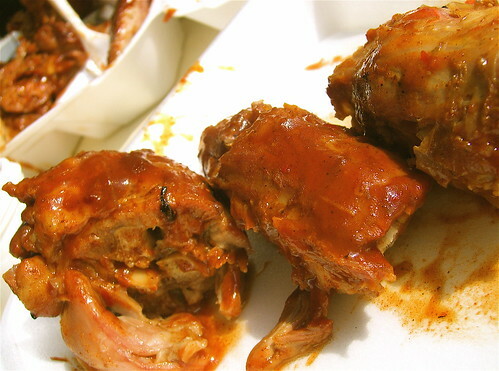 The secret barbecue sauce, apparently Heaven sent as well, is a satisfying combination of sweet, spicy and vinegary. Finally, the bone chewer in me is entirely pleased as I gnaw on the neck like it was a meat riddled corn-on-the-cob. Any meat inevitably wedged between my teeth was saved for snacking later. Any sauce stuck under my nails was siphoned out for the snack's condiment. The standard stuff on the church's menu are just as good. The barbecued pork ribs are super tender, falls of the bone, etc. The same sauce drenched onto the turkey neck is also gopped on the slabs of pig, all served with sweet and smoky baked beans and chunky potato salad. The ingenious edible napkin otherwise known as Wonder Bread is a nice touch since the regular napkin is woefully inadequate. 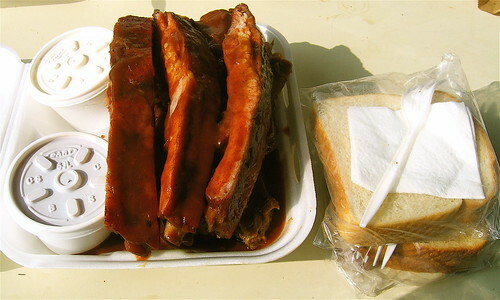 Divine BBQ pork ribs with edible white bread napkins. 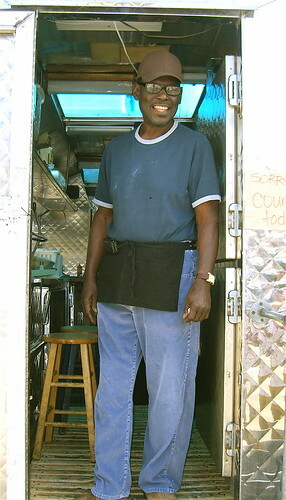 Big Jack, the man who runs the smokers and does most of the heavy cooking, makes sure that each item is as good as the next. He's on a mission from God and cooks accordingly. If you're in the neighborhood and are of the generation who remembers the Los Angeles Lakers when they defined "Showtime", then stop by and ask Big Jack about his pick up games back in the day with the likes of Michael Cooper and Norm Nixon. Big Jack was a baller way back with a semi-pro team, but it's safe to say he's all pro now with the church's Q. Big Jack and his box. I only wish it hadn't taken me this long to get down here. I first heard about the BBQ Church five years ago from a local public radio show and when I attempted to navigate my way around Compton at night, I lost my nerve and gave up on the turkey necks. The Associate Pastor humbly acknowledges that in the beginning he almost gave up on the turkey necks too and, perhaps, lacked faith in Pastor Williams' vision. Now, he among many others are true barbecue believers. 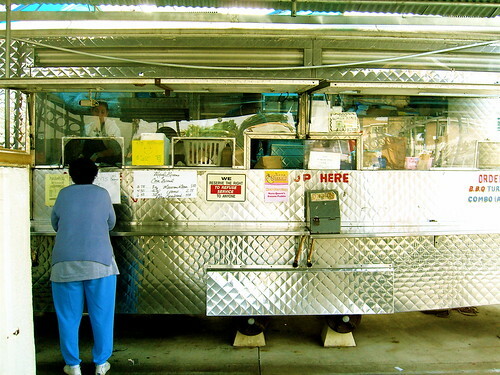 It's easy to believe now, especially when they continue to sell out of food with lines to the truck rivaling that of the Kogi BBQ Truck on some Saturday afternoons. The church has even shipped orders of their food to points as far as Seattle and Memphis. Talk about spreading the gospel far and wide. Associate Pastor Virgil Wilson, a man on a delicious mission from God. Talk about a church that barbecue built. This grub comes straight from the Top. This isn't just soul food. This is Save Your Soul food, my brothers and sisters! Yum, yum and amen to that!! Those turkey necks actually look pretty tasty. I'm always up for some good BBQ. I liked the turkey necks over the pork ribs, but that's just me. The pork ribs were really great too. The only way the turkey necks could be better is if they were ostrich necks. Maybe they have a suggestion box. I am going post haste. How fantastic! Thanks for the tip. Best lunch I've had in ages, with the nicest people in town serving it up. I'm certain you're going to love the food and the experience. Thanks for the note. Thanks for letting me know. It's always great to hear when someone tries out one of my recs. I'm very happy you enjoyed your experience. And, yes, the nicest people! Turkey Necks! I'm from the south and I've recently discovered turkey necks. Awesome. Glad to see Turkey necks all over the states! I always enjoy your "Good Food" appearance, but in writing you are even funnier!! I'm determined to try the neck next time I'm in LA. Thank you! That's great to know. I'm very happy you enjoy my work. I sincerely appreciate it!